← Food Safety and the Environment: Can We Have It All? This year’s United Fresh trade show is in Dallas and being held in conjunction with the Food Marketing Institute (FMI) and American Meat Institute (AMI) events. As a result, there is ample opportunity for show attendees to sample and graze on the exhibit floor. The free lunch spans from noon to 5pm and includes chicken and cheese chimichangas, a variety of freezer case grocery store pizzas, meat free mushroom burgers and hot dogs along with chinese chicken salad and anti-oxidant heavy cherry juice. Then comes dessert. Well, this is when it gets really exciting. How about a giant Oreo cookie? (Pardon the blurriness of the photo but I could hardly contain my excitement.) 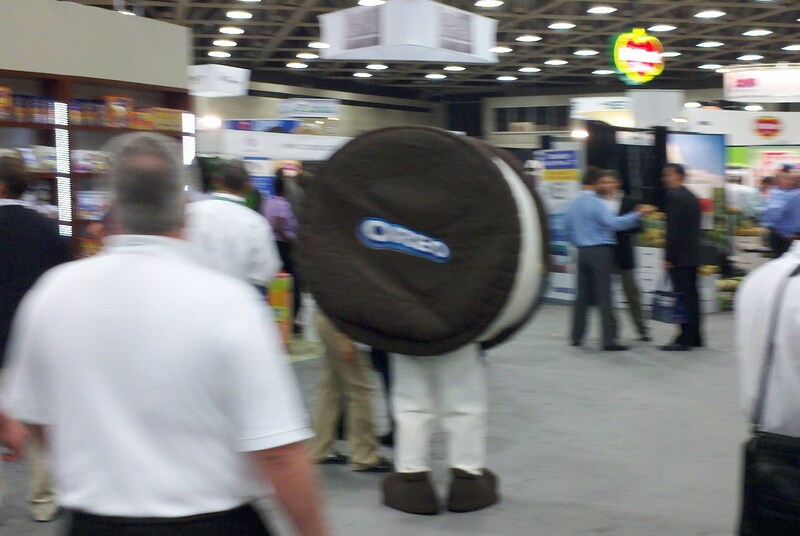 Yes, the giant Oreo was making its rounds at the show. All kidding aside, what makes this show different from the annual Produce Marketing Association show is that, because it’s being held in conjunction with FMI and AMI, we have people coming to our stand asking about temperature monitoring for things other than produce. Can you track chicken or seafood? How about frozen foods? Yes, we can! In fact, we have several projects underway involving those types of food. If you’re at United Fresh/FMI/AMI this week, please swing by the Intelleflex booth (#10419) and you can join me on today’s quest: to have my picture taken with the giant Coca Cola Polar Bear!